Pictured above: The benthic observatory system is left on the seafloor for a few minutes to capture 360-degree images of fish in the area, before it is pulled back up to the surface and onto a ship. Just how many fish are in the sea? That’s a key question for resource managers trying to determine the health of rockfish off the California Coast. A new seafloor observatory system developed by MBARI in collaboration with conservation-minded organizations, academic partners, and fishermen will greatly enhance efforts to visually and accurately assess this fishery. 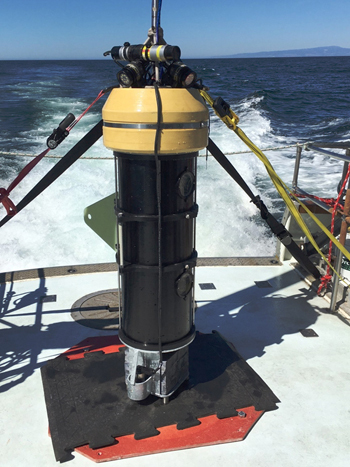 A two-camera prototype of the benthic observation system on a research vessel in Monterey Bay. Photo by Chad Kecy. Some species of commercially caught rockfish off the West Coast of the US have been severely overfished and are managed under rebuilding plans. To save the fisheries long term, the National Marine Fisheries Service sets catch limits and closes fishing in certain areas at certain times. Traditionally trawl nets have been used to sample the abundance and size of fishes, so that regulators would know where and when to restrict the harvest to avoid overfishing certain species. However, trawl nets are not very efficient in the rocky seafloor areas where these rockfishes live so the health of these species is not well understood. The Nature Conservancy and other partners had begun to monitor the fishes with two cameras mounted on a frame that could be lowered from a boat to the seafloor. This was an improvement over the nets, but presented its own challenges because it was bulky, difficult to move from site to site, and could not easily land upright on rocky terrain. The David and Lucile Packard Foundation, which provides support to The Nature Conservancy and to MBARI, brought the two organizations together to address this challenge. In 2017 an MBARI team led by Electrical Engineer Chad Kecy applied its engineering expertise to improve visual monitoring in challenging, deep rocky habitats. By the end of the year, a prototype benthic observatory system had been designed and built and used successfully for several surveys. The new system is much easier to launch and recover from a ship. With plenty of weight at the base of the design and flotation and lights at the top near the tether attachment, the new system provides a relatively stable platform even if it lands on uneven terrain. The prototype system uses two high-definition video cameras that can record stereo video in just a minute or two, after which the system is lifted off the seafloor and moved to a new location. Once back on land, another collaborator in the project, Rick Starr, a fisheries biologist at Moss Landing Marine Laboratories, reviews the video to identify and count fishes. Software that can stitch together the two video streams can be used to determine the size of each fish captured in the video images. Fish size is one factor in determining the health of the fishery stock. In 2018 Kecy’s team will build a more advanced system with eight cameras to provide near 360-degree views of the seafloor. This system will also have more sophisticated camera controls and a robust tether that will allow researchers to record and store video onboard the ship instead of inside the benthic observatory system. MBARI Software Engineer Chad Kecy checks videos and data during a test deployment of the benthic observatory system. Once the eight-camera system is perfected, the technology will be passed on to a nonprofit organization, Marine Applied Research and Exploration (MARE), which is dedicated to ocean exploration and conservation. MARE has the technical expertise to operate and maintain the system and to conduct rockfish surveys from boats up and down the California coast. 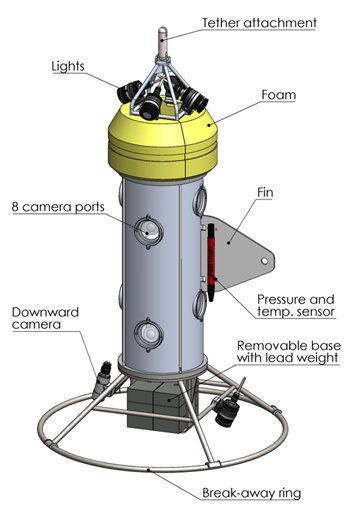 This illustration shows the main components proposed for the eight-camera benthic observation system, to be built in 2018. Image by Chad Kecy. The original two-camera system will be available to MBARI Scientist Kelly Benoit-Bird for use in her acoustic ocean ecology research. Because the system was built with the potential for future expansion, it is possible that other researchers will also adapt it for their specific research needs. The development of the multi-purpose benthic observatory system shows how collaboration between MBARI, conservation organizations, regulatory agencies, and other research organizations can benefit all involved. The resulting technology will help further the understanding and conservation of important fisheries and fish habitats. Scientists use the complementary tools of acoustic sensing and optical imaging to observe biological phenomena in the ocean.